The cosmetics company Beiersdorf AG, globally known for its brands Nivea, Eucerin and LaPrairie, placed importance on social responsibility ever since it was founded 130 years ago. The last few years saw a re-organization and improvement of its global supply chain. Simultaneously, a new sustainability strategy was worked out and CSR has been embedded more thoroughly in business processes. 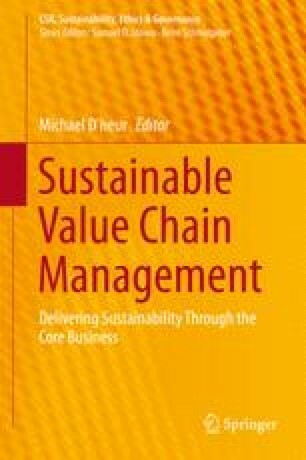 Sustainable value creation through cooperation is an essential part of its supply chain strategy and daily operations. Beiersdorf. (2013a). Data & facts; Beiersdorf AG. http://www.beiersdorf.de/Investoren/Daten_Fakten/Aktuelle_Daten.html. Accessed 11 June 2013. Beiersdorf. (2013b). Press release by BDF AG dated 26 March 2013, Beiersdorf AG. http://www.beiersdorf.de/Presse/Pressemitteilungen_News/Personell_Ver%C3%Aenderungen_im_Beiersdorf_vorstand/html. Accessed 11 June 2013. Beiersdorf. (2013c). Sustainability reporting and Beiersdorf AG, Beiersdorf AG. http://www.beiersdorf/de/Nachhaltigkeit.html. Accessed 11 June 2013. ECR. (2013). What is ECR? http://ecr-all.org/about-ecr-europe/. Accessed 11 June 2013. Gartner. (2012). The Gartner framework for aligning global logistics with a demand-driven supply chain strategy. http://www.gartner/com/DisplayDocument?doc_cd=239631. Accessed 11 June 2013. SCC. (2011). Supply Chain Operations Reference (SCOR) Model. In Supply Chain Council. http://supply-chain.org.scor. Accessed 11 June 2013.